After a two week hiatus I'm back with my Belgian beer review for June AND Barb is back after popular viewer demand! This beer isn't a lambic, it's just a fruit ale made in Belgium. It was also a 2010 vintage. I really didn't know what to expect but I figured Barb would find it interesting - but would I....? 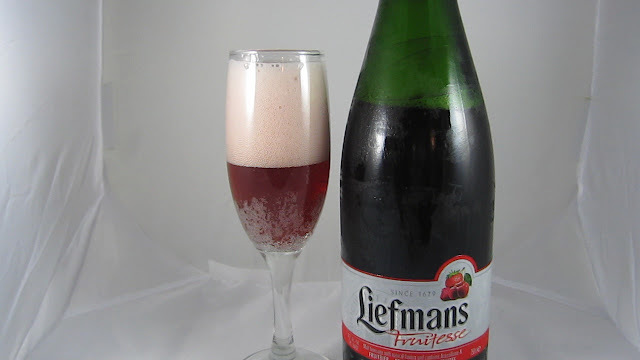 Liefmans Fruitese is a beer that, if I were drinking it blind, I wouldn’t think it’s a beer and probably wouldn’t like it as much. Even though this is a Belgian fruit beer, it’s not a lambic and bears very little resemblance to actual beer since the fruity taste and sweetness dominates the palate (seriously, are there even hops in this?). That being said, for all its un-beer-like characteristics, I have to admit this is still a tasty, refreshing beverage. I split a 2010 vintage 750ml caged and corked bottle with a friend. We both poured it into champagne flutes. Appearance: Dark pink to cranberry red body; clear with champagne-like effervescence. Forms a large, pink/indigo, soapy head which mostly fizzles away but still laces the glass rather well. Smell: Very sweet scent of fruit cocktail, candy, and sugar. Taste: I’ve had a few authentic Belgian lambics and I admire them for their brewing technique and the fact they taste like the fruit they’re brewed with. In the case of Liefmans Fruitese, it’s almost the opposite. Even though it’s made with real fruit it does seem a little artificial. This could be because the beer is brewed with added sugar (and possibly some additional "natural flavors"). Strawberry, cherry and raspberry all dominate the palate. It’s a familiar taste as it reminds me of any kind of red colored Jello or bubblegum. But despite all that sweetness, the beer still finishes clean and it’s very refreshing while in the mouth. At no point is the sweetness cloying or annoying. It’s quite tasty in as much as the aforementioned consumer products are tasty. So yes, you can easily drink several servings before it becomes taxing. Not that it’s absolutely delicious, and I could easily understand anyone saying this is too sweet for their tastes. Personally, I don’t think it is, but the palate itself could use a lot more authenticity to it all around since it’s so close to being an alcopop. Drinkability: At 4.2% ABV, this is a little bit bigger than something like a Lindemans lambic, but still quite small that you can drink the entire bottle and still be able to drive home. The mouthfeel is light and thin and extremely crisp. The carbonation and fruit taste work well together and make for a refreshing palate with a remarkably clean, if not dry, aftertaste. A good beer to have as a liquid dessert.